The intelligent fencing system LEGI R is at the top of a longer than 60-year success story in fence evolution. 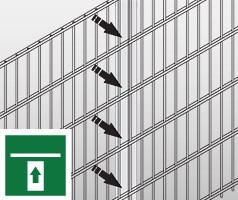 The unique design of overlapping grilles provides for a high load-carrying capacity. 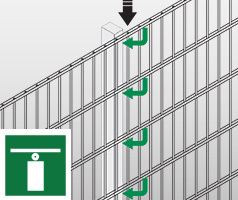 The security of this system in terms of protection against strong applied forces is unrivalled for a TÜV-certified LEGI safety fence, only surpassed by the expansion of the R+ATK. One of the main arguments for the three variants of LEGI R uno, LEGI R pur and LEGI R fit, however, is the aesthetic appearance of the “all-rounders in the world of fences,” which are available both with solid pipe posts as well as with filigree wire posts. With only one screw connection per post, the grilles are securely locked in their mounting points. Perfect in design, security and ease of installation. The grilles bolted from the property side impede intruders from dismantling the grilles and provide you with extra security. LEGI R uno is bolted from the outside, for instance from the street side. 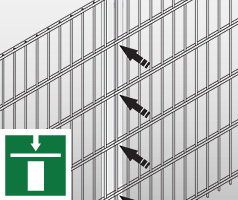 The unmistakable, overlapping mounted LEGI grilles ensure a high degree of stability.